So I was craving some chocolate covered nuts but am trying to eat clean, which means the ones at the store that come prepackaged are probably spiked with some artificial stuff here and there, or at least more than I’d like, so I decided to make my own. 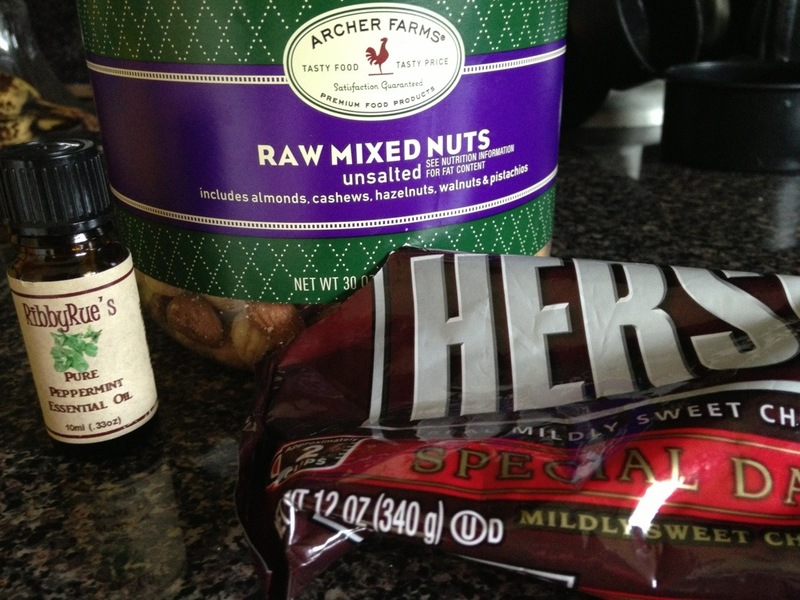 I had this container of mixed nuts from Target, Peppermint essential oil (which I add to everything because its just AWESOME, though its not necessary), and a bag of Hershey’s dark chocolate chips. Here’s what I did. Quite simple. 1. I only used about a third of the bag of chocolate chips, threw them in my smallest sauce pan, turned it to a medium low heat and kept stirring until they were melted. Once melted, turn off the burner and add a Tablespoon of canola oil. This is where I also added about 4 drops of my peppermint oil. Its perfect. 2. Then I simply tossed in the nuts and stirred them up till they were all well coated. I don’t know how much I added, I just kept adding until the chocolate was sufficiently used up without much excess. Sorry for the poor photo. 4. I slid the pan into the top of my freezer for them to harden. 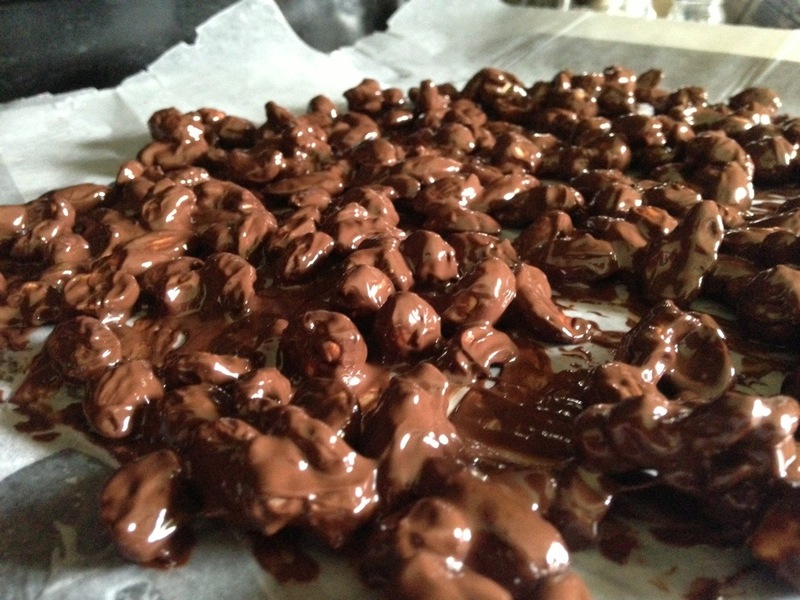 Then I pulled it out an hour or two later, pulled the chocolate nut pieces up and put them into a quart sized bag. I sealed it, then banged it around on the counter a little to break it up and Voila!! 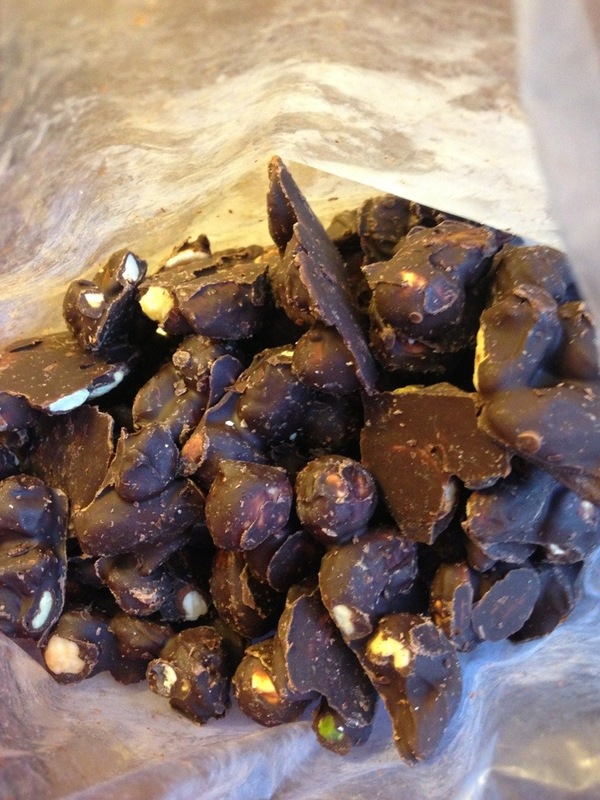 Homemade, healthy, flat belly diet approved, chocolate covered nuts!! 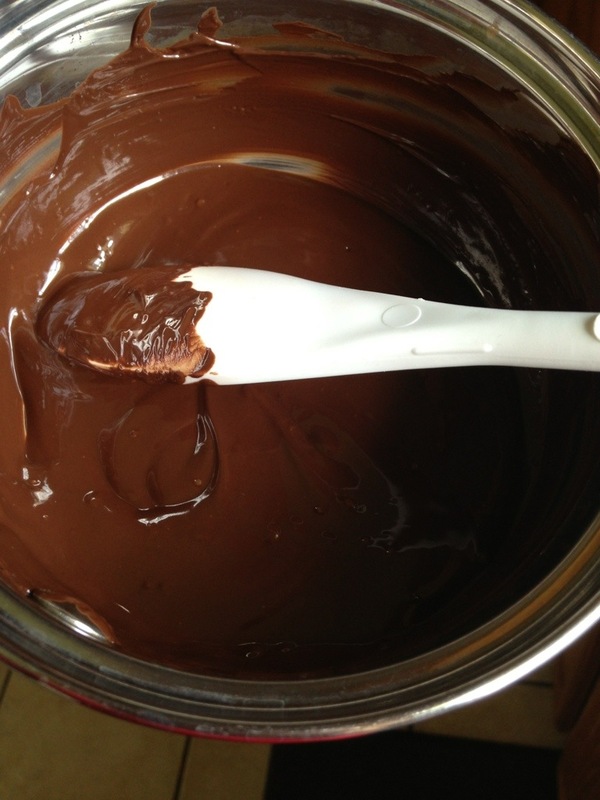 Melt the chocolate chips over medium low heat in a sauce pan, stirring continually. Only takes a couple minutes. Once completely melted, turn off heat, add 1 Tbsp Canola oil and 4 drops Peppermint essential oil if you’re adding that, and stir until blended. This keeps the chocolate smooth and manageable. 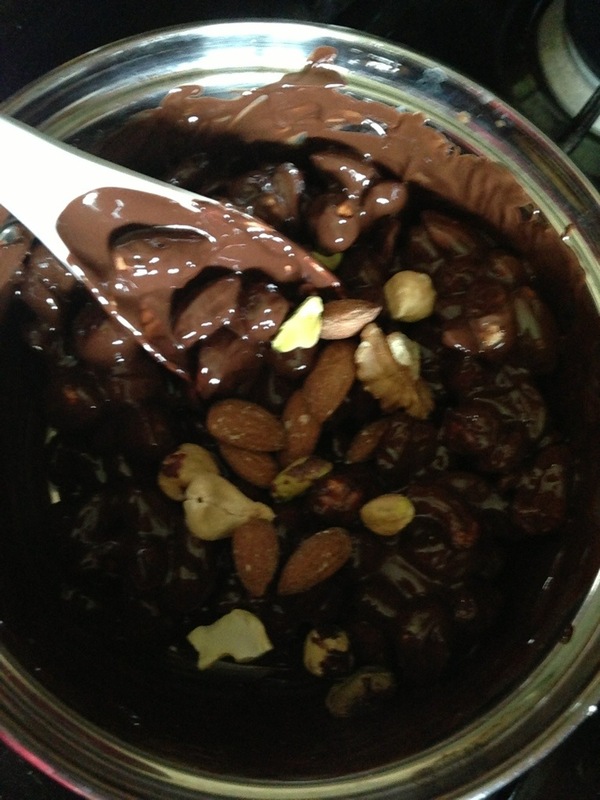 Toss in the nuts, stirring to coat until all chocolate is used and all nuts are coated. Add more nuts if needed. Line a pan with parchment paper or foil, scoop out the nut mixture onto the pan, smoothing it out into a single layer. 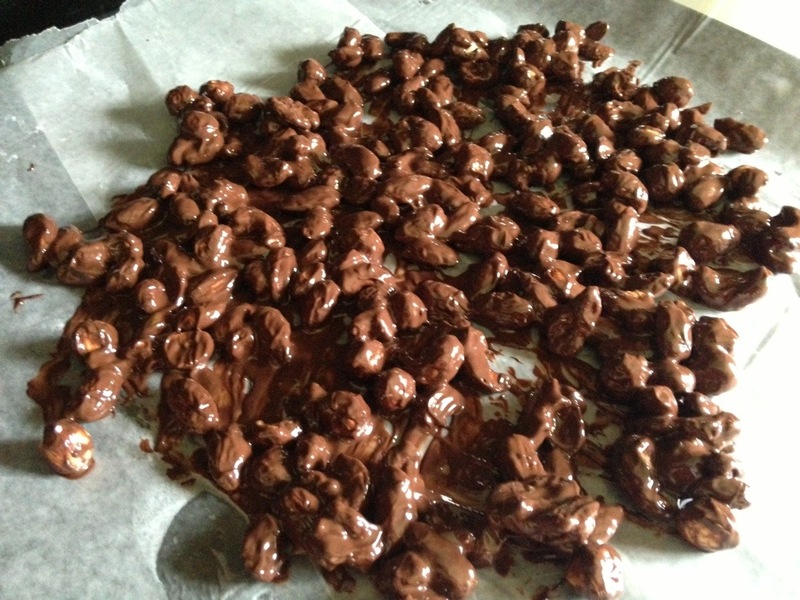 For chocolate chunks, let it be all chunky, but for more individual nut pieces, make them as spread out as possible. Set pan in your freezer for an hour or two, pull it out, remove the nut and chocolate pieces, put into a container or quart sized ziploc, break it up if desired, and store in fridge or freezer for a nice little treat!! Enjoy! !